It’s a couple weeks into 2013 and many people are still very dedicated to their new year’s resolution of weight loss or a healthier lifestyle. Some of these new exercisers are filling the gyms or enjoying the jogging paths in their new, hopefully perfectly fitted, athletic shoes, while still others are starting to develop pains and injuries. There are many common injuries associated with running and new exercise routines, many treatable at home, while others require a visit to your podiatrist. 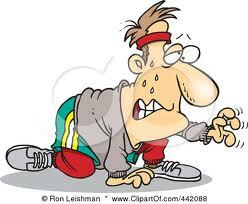 Many new exercisers start out in a very high intensity routine, almost guaranteeing themselves an injury from overuse. The constant repetition of contraction and release of muscles that many exercises require can lead to muscle tears or ruptures. Injuries can occur in all body parts including the knee, shin, ankle, and foot. Pains that occur in the knee are commonly called runners knee and are caused by the foot rolling inward too much, called excessive pronation. This can be treated and prevented by custom orthotics which can be prescribed by a podiatrist. Orthotics can also be an effective treatment for another common injury that presents with a painful ache on the front and medial side of the leg caused by inflamed muscles, called shin splints. The left image shows a foot with a healthy arch: the plantar fascia is relaxed. The right image shows a flattened arch: the plantar fascia is stretched tight with inflammation at it’s heel attachment. The foot can experience many different injuries from overuse. A pain in the heel of the foot, called plantar fasciitis, is often caused by stress on the bottom of the foot. This can be caused by excessive pronation, poor fitting shoes, and overtraining. Heel pain can also be caused from pain and tightness in the large muscles of the leg from repetitive rising up on the toes that leads to achilles tendon inflammation and pain at the back of the heel. Another common overtraining injury is a stress fracture. This happens because of repetitive forces from the ground and body being applied to the bones in the foot. This temporarily weakens the bone and without proper time to recover, commonly seen with overuse, the bone will eventually fracture. This could stop your activity altogether for 4-8 weeks wiping out the work you’ve done previously. Make an appointment with First Coast Foot and Ankle Clinic and let us help keep your new exercise routine going strong, and your feel feeling great.